Hover text: You can also just mash the keyboard at random, but you might end up with a gibberish name no one can pronounce. How long until we start seeing people on the fora with these usernames? I've never successfully grabbed this name anywhere else, but there's usually a character minimum greater than three. heuristically_alone wrote: How long until we start seeing people on the fora with these usernames? Given what we already have? "registereduser" and "registeredname" are also colorful options. Coincidentally, I was thinking that, after winning Powerball, I'd open an anonymized Trust named "correcthorsebatterystaple" . Now that I've revealed that, some other chump is going to ninja the name away from me. I think it's just an observation that a username generated by keyboard mash is likely to still be available. Explainxkcd thinks yes, the title text refers to "xkcd". I guess that's possible: x, c, and d are right next to each other in a little triangle, and k is over on the other half, so if you did a two-handed keyboard mash, it's conceivable that you'd end up with "xkcd". But I thought that Randall specifically came up with that sequence of letters because it doesn't spell anything and doesn't look like an abbreviation or acronym for anything. HES wrote: I've never successfully grabbed this name anywhere else, but there's usually a character minimum greater than three. 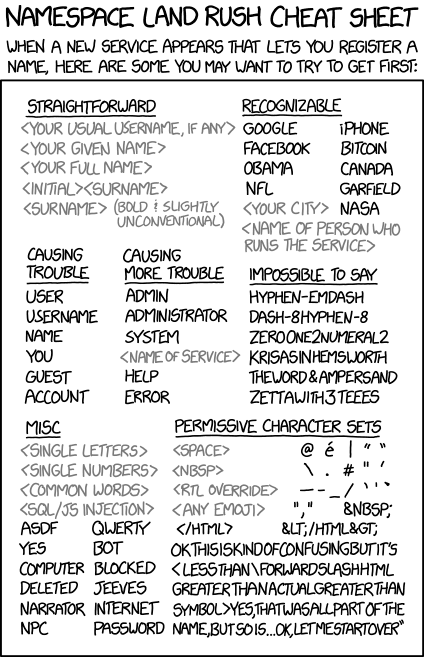 Reka wrote: [...] if you did a two-handed keyboard mash, it's conceivable that you'd end up with "xkcd". But I thought that Randall specifically came up with that sequence of letters because it doesn't spell anything and doesn't look like an abbreviation or acronym for anything. For the longest time, I just couldn't accept that. I was using Linux and Unix, at home and at work, so I was constantly using things like xterm, xload, xclock, xev, xcalc, xrdb, xwhatever... "xkcd" just had to mean something. Yeah I would have expected <pop culture reference> to be in the list. Um, the fora have rules against sockpuppeting, yes? GlassHouses wrote: For the longest time, I just couldn't accept that. I was using Linux and Unix, at home and at work, so I was constantly using things like xterm, xload, xclock, xev, xcalc, xrdb, xwhatever... "xkcd" just had to mean something. It's obviously the Change Directory command as specifically implemented for the Korn shell as wrapped in the X Windows System gui, paradigm. But, then there’s the land-grab-regret syndrome. I decided to keep the dot-wtf version because I like using the email address Oh me yarm (script-lowercase-a-in-a-circle-not-capital-A-that-would-be-the-anarchist-symbol) greatagain.wtf. At this point, I’d like to transfer the domain name free to a good home, if anyone here is interested. You have my email address. Oh drat, it's March Madness. Regarding my previous post, my email address is not "oh me yarm@greatagain.wtf", it's what I typed that then got maddeningly converted to "oh me yarm". EDIT: It was the letters O, M, and G all run together. Last edited by DanAxtell on Tue Mar 06, 2018 11:49 am UTC, edited 1 time in total. Oh, oh me yarm is what was converted... what was the original word? DanAxtell wrote: Oh drat, it's March Madness. That's not March Madness, it's the common or garden-variety All Year Madness. speising wrote: That's not March Madness, it's the common or garden-variety All Year Madness. Indeed, "yarm" has 105 hits since 2014 (106 now). People were using "Oscar Mike Golf" on this board long before the movie, "Whiskey Tango Foxtrot" came out. In any case, I'm going to be wary of March Mod Madness now. I realize that it may not happen, but I can't shake the existential angst. ANONYMOUS is always a great grab. bantler wrote: ANONYMOUS is always a great grab. Beware that apparently some services won't accept some names like that as usernames, even if they're real functional email addresses. I don't have a Facebook account, but for a dev project a few years back I needed to have one because the thing I was helping build was Facebook-driven. So I made a fake Facebook account, and create a new address, nobody@, on one of my own domains, to use to register the fake account. It was a real, fully-functional IMAP account. But when I told Facebook that that was my email address, it came back at me with something along the lines of "no really, what's your email address?" A guy I met an uni had something along the lines of "firstname.littlepig@gmail.com" based on the same general idea. The forums do make a little more sense after you realise some Madness varieties are perennial. Still not perfect sense, but a little closer. DanAxtell wrote: But, then there’s the land-grab-regret syndrome. I'm missing one name in the causing more trouble category: "root"
When I regularly used a whole @<my-name>.me.uk domain for many things (the pre-@ text being useful to differentiate registrations and other correspondents both personal and impersonal, so as to blacklist those places that get too clingy with my provided contact details) I had the occasional problem with places that were not happy with the .me.uk part. Obviously programmed to recognise .co.uk, .ac.uk and likely .org.uk and .gov.uk but not updated to accept the .me 2LD. I occasionally got around that simply by registering as something like <yourservice>@<my-name>.me.uk.your-valiator-is-broken.com (or even with the .invalid TLD, just to be extra sure I wasn't initiating the spamming of someone else's strangely named MX, yet ironically getting through the validator) where I didn't need any form of confirmation email to work during registration. Only tangentially related, but: I have an email address that's <my first name>@<my last name>.com, and CSRs just can't seem to wrap their heads around that concept, always asking "at... gmail? yahoo?" after I tell them. "No, no, the at comes before my last name, and there's nothing between that and the dot-com. Yes, I own <my last name>.com. Yes really." More like how I chose my username, i.e. grkvlt. It looks like keyboard mashings, but is actually an unpronounceable utterance made by a parrot in a Donald Duck story by Carl Barks (WDC&S issue unknown and I can't find my copy right now). This makes a splendid choice for a username since it's never taken and if it exists I can be pretty sure I registered an account... Until now, obviously. Oops. On a related note, I wonder how long before .egg and .muffin are available. grkvlt wrote: More like how I chose my username, i.e. grkvlt. It looks like keyboard mashings, but is actually an unpronounceable utterance made by a parrot in a Donald Duck story by Carl Barks (WDC&S issue unknown and I can't find my copy right now). I don't remember that story but I'm intrigued. All I can think of is Hortense McDuck saying "Glxblt" in Don Rosa's stories. Soupspoon wrote: You can also just mash the keyboard at random, but you might end up with a gibberish name no one can pronounce. As you can see, I ended up with a name like that anyway, except it does have a pronunciation.